Over the last 13 years working at Upper Deck, I’ve had the unique privilege of attending some incredible (and historic) sporting events. I watched the truest fans I’ve ever seen chew off their fingernails and then crumble to their knees in grateful praise during the final minutes of the Patriots Super Bowl victory over the Rams in 2002. I was sitting just three rows behind home plate for Schilling’s heroic victory in game six of the 2004 ALCS. And, on a crisp October night in Chicago, I witnessed a city of nearly 10,000,000 people inhale a collectible gasp of horror as a die-hard Cubs fan caught a foul ball intended for the glove of Moises Alou. All in all, I’ve attended dozens of MLB, NFL, NHL and NBA regular season games, a handful of Super Bowls, World Series and Stanley Cup Finals games, and met an impressive array of the biggest athlete superstars in the world. It’s a great job and I’ve loved every moment along the way, but you might be surprised when I tell you about my most treasured moments here at Upper Deck. They have nothing to do with attending games, or getting VIP access to the star-studded parties, or even meeting superstar athletes. Those are fantastic memories, of course, but can’t compare to meeting the sweepstakes winners (and die-hard fans) who have joined us at those aforementioned games, parties and athlete gatherings. I had the pleasure of meeting one such Upper Deck winner at last night’s American Idol Finale in Los Angeles, and it will absolutely be added to my growing list of favorite moments. 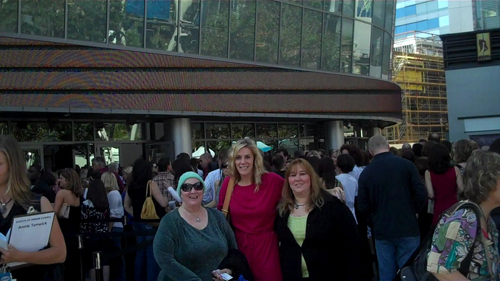 “I’ll never forget this, as long as I live.” Marti Goucher, our American Idol sweepstakes winner, whispered those words just as we started our journey into the Nokia theater for the live Finale show. It was an exciting moment for everyone there, but it was especially momentous for Marti. 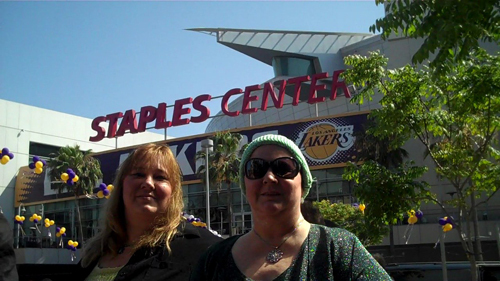 As a passionate AI fan (and an even more passionate Clay Aiken devotee), Marti’s journey to Los Angeles for this week’s Adam Lambert/Kris Allen match-up was probably a bit more harrowing than the average Southern California mother-daughter tag team in attendance. 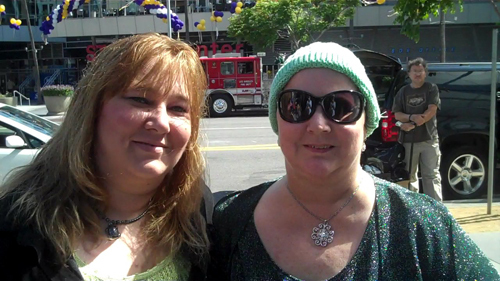 Marti has spent the last few years battling cancer and undergoing extensive chemotherapy treatments. In fact, when Upper Deck called her house to give her the good news, she was actually in the hospital receiving one such treatment. The news of her own American Idol victory quickly lifted her ailing spirits. With her daughter in tow at this week’s VIP American Idol events, Marti quietly and carefully navigated through the crowd of beautiful people outside the theater on Tuesday night. Her wide eyes and beaming smile reminded me of the special connection between a fan and that one thing they love so much… whether it’s a baseball team, a superstar athlete or a TV show that turns average people into overnight singing sensations. Don’t get me wrong, seeing the Finale LIVE was an amazing experience, but the more memorable moment was the special honor of sharing a dream come true with an incredibly deserving fan! So, as long as I live, I’ll never forget Marti Goucher and what this once-in-a-lifetime experience meant to her. There was a surprisingly competitive atmosphere at the Nokia Theater. Nearly everyone there was passionately supporting either Adam or Kris. No one seemed to be “on the fence”. The crowd was mixed 50/50, with an equal number of fans supporting each finalist. 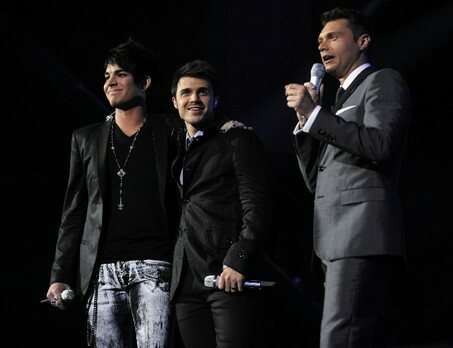 In person, Adam’s voice is very loud and very powerful! I was shocked and amazed by his vocal prowess. In person, Kris is just as adorable and unassuming as he appears to be on TV. Using a baseball analogy, Adam supporters reminded me a lot of Yankees fans: very loud, very loyal, a bit arrogant and a handful of them actually heckled and booed the opposing team… uh, I mean performer. Unfortunately, one of the most obnoxious sat directly in front of me. Sticking with the baseball comparisons, Kris supporters were more like Cubs fans: likeable, nervous and fully embracing the “we’re just happy to have gotten this far, but we probably won’t win” spirit. Unlike baseball, the male-to-female ratio was about 1-to-50. The cougar to non-cougar ratio was about 25-to-1. I’m guessing a big contingency of fans drove up from Orange County. Surprisingly, the majority of the poster-board signs were brought and displayed by adults, not kids. Carrie Underwood was incredible. Too bad the TV broadcast cut off her performance before it was finished. Yes, Ryan Seacrest is definitely shorter in person. Upper Deck at the American Idol Finale. Maybe With You? Just wanted to let you know that we lost mom (Martha Goucher) on May 24th of this year. Thank you for the kind words you wrote about her.